If protruding or disfigured ears bother you or your child, you may consider plastic surgery. Ear surgery – also known as otoplasty – can improve the shape, position, or proportion of the ear. 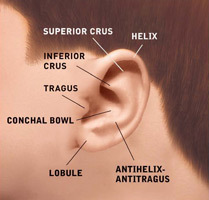 It can correct a defect in the ear structure that is present at birth and can treat misshapen ears caused by injury. Your plastic surgeon will also discuss where your procedure will be performed. Depending on the type of surgery, your procedure may be performed in your plastic surgeon’s accredited office-based surgical facility, a licensed ambulatory surgical center, or a hospital. Be sure to ask your plastic surgeon questions. It’s very important to understand all aspects of your ear surgery. It’s natural to feel some anxiety, whether it’s excitement for your anticipated new look or a bit of preoperative stress. Don’t be shy about discussing these feelings with your plastic surgeon. Medications are administered for your comfort during the surgical procedure. The choices include local anesthesia combined with intravenous sedation or general anesthesia. Your doctor will recommend the best choice for you. 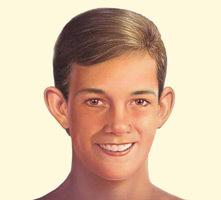 Correction of protruding ears uses surgical techniques to create or improve the antihelical fold (just inside the rim of the ear) and to reduce enlarged conchal cartilage (the largest and deepest concavity of the external ear). Incisions for otoplasty are generally made on the back surface of the ear. 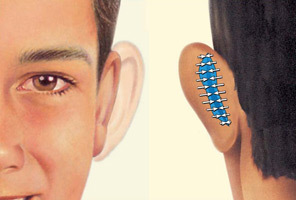 When incisions are necessary on the front of the ear, they are made within its folds to hide them. Internal, non-removable sutures are used to create and secure the newly shaped cartilage in place. Ear surgery offers near immediate results in cases of protruding ears, visible once the dressings are removed. With the ear permanently positioned closer to the head, surgical scars are either hidden behind the ear or well-hidden in the natural creases of the ear. Dressings will be used to support the new shape of the ear during the initial phases of healing. Once these are removed, the results of your ear surgery are immediately visible. With the ear permanently positioned closer to the head, surgical scars are either hidden behind the ear or well-hidden in the natural creases of the ear. • Where will I be taken after my surgery is complete? • What medication will I be given or prescribed after surgery? • Will I have dressings/bandages after surgery? The decision to have ear surgery is extremely personal. You will have to decide if the benefits will achieve your goals and if the risks and potential complications are acceptable. You will be asked to sign consent forms to ensure that you fully understand the procedure and its risks. The results of your ear surgery are immediately visible. Over time, post-surgical swelling will resolve and incision lines will fade. Satisfaction with your new image should continue to grow as you recover from surgery. The final results of your surgery will appear over the next few months. Following your physician’s instructions is essential to the success of your surgery. It’s important that the surgical incisions are not subjected to excessive force, swelling, abrasion, or motion during the time of healing. Your doctor will give you specific instructions on how to care for yourself. It’s very important to follow your plastic surgeon’s instructions and attend follow-up visits as scheduled. Prices for ear surgery can vary. A surgeon’s cost may be based on his or her experience, the type of procedure used, and the geographic location of the office. Many plastic surgeons offer patient financing plans, so be sure to ask. 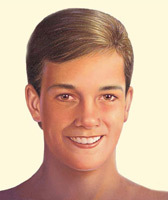 Some health insurance plans cover otoplasty in children. In adults, it may be considered cosmetic surgery and therefore not covered.